Superstar motorcycle riders Ewan McGregor and Charley Boorman have called on a crack team of UK experts to provide them protection during their 15,000 mile trip. But the intrepid motorcyclists currently riding from John O’ Groats to Cape Town in South Africa for the Long Way Down programme, haven’t called on military experts. Instead they’ve asked UK firm Buffera to make them special Long Way Down Unicef Buffs to stop their necks getting burnt on the trip! 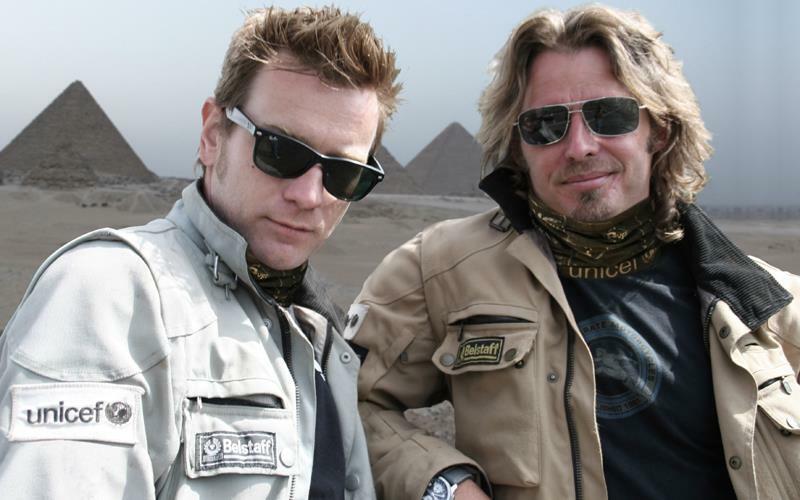 Both Ewan McGregor and Charley Boorman will be using the specially-designed UV protective buffs during the Long Way Down, and all proceeds of sales of replica Buffs will got to charity partner UNICEF. Ewan McGregor said: “People ask about or travels all the time and what stands out for us the most. For both Charley Boorman and I it’s the incredible work of UNICEF on the ground, working to give children the care and support they need to survive. So please dig deep to give something – however much it is – to help UNICEF. The Buffs are made from Coolmax Extreme fabric and are designed to wick moisture away from their skin. It blacks out 95% of all harmful UV rays and can be worn as a balaclava, neck warmer, face mask or headband.